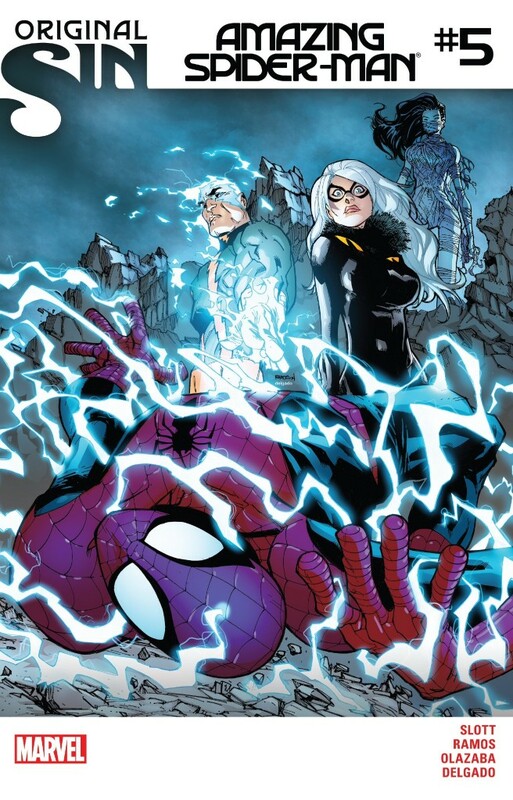 In the first four issues of this new volume of Amazing Spider-Man, Dan Slott has introduced a number of significant plot points involving the likes of Peter Parker and Parker Industries, J. Jonah Jameson, Electro, Black Cat and the brand new character Silk. So given Slott’s track record in story construction, it was only a matter of time before all of these points converged to create a singular story, and ASM #5 unquestionably weaves those webs together. The way Slott guides a narrative with so many moving parts is arguably without peer in the comic book industry, and that remains the case in ASM #5. In this issue, Slott brings together all of the aforementioned plot points in logical fashion; Peter, still trying to figure out why he’s uncontrollably playing tonsil hockey with Silk, is needed for a television spot at the Fact Channel, which has just hired Jonah. Silk goes with him because she wants to “see the world.” Black Cat, backed by Electro, sees an opportunity to attack Peter (or assumingly anyone from Parker Industries) with the understanding that such an act will draw out Spider-Man. In that regard, I don’t have a problem with how Slott’s larger narrative master plan is put into motion. But I’m still struggling with the age-old conundrum of watching Slott prioritize story over character. I know I’ve talked about this before both on Chasing Amazing on the Amazing/Superior Spider-Talk podcast, so I apologize for the redundancy. Then again, as long as comic book creators continue to craft their stories about Spidey the same way, time after time, I guess you can expect me to take a stand as to why I think it’s a flawed approach. 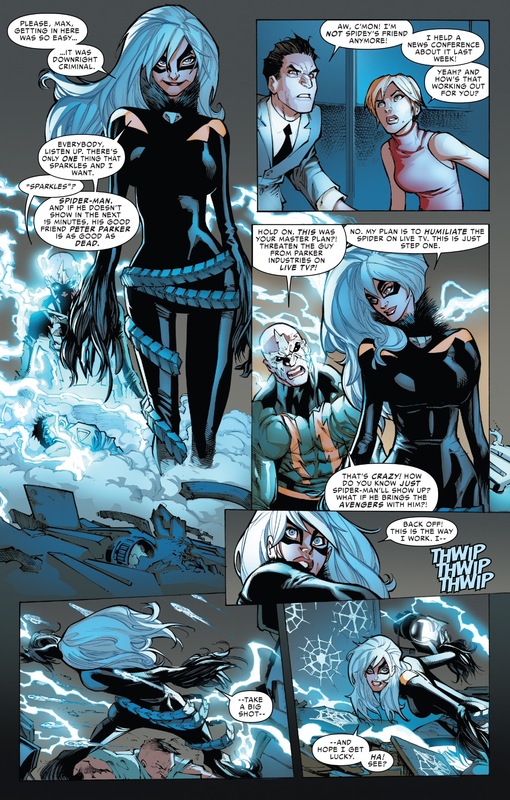 In terms of my specific issue with ASM #5, it starts and ends with Felicia Hardy, aka the Black Cat, whose characterization I sounded off about in my write-up of ASM #3. To be totally blunt, I have never not wanted to read about a long-standing Spider-Man character as much as I don’t want to read about this current incarnation of Black Cat (though, I guess a case could be made for any story involving Silver Sable at this point). The over-the-top villainy of this character – maybe Humberto Ramos can illustrate a moustache for her to twirl since it really has reached that point – reads as being so incoherent, that I’d just as rather Slott have created a brand new character. Maybe we can name her Alicia Tardy? 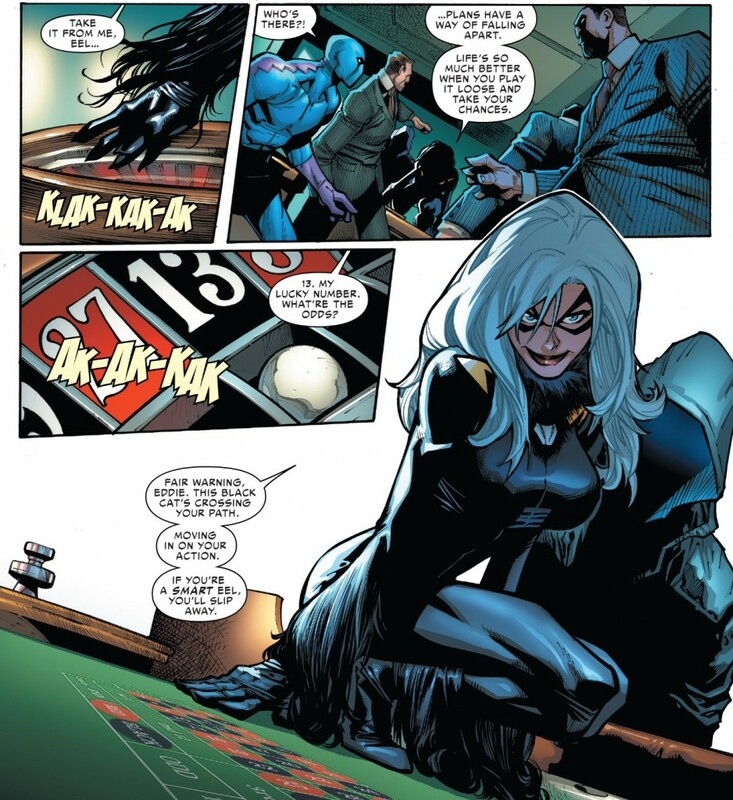 And regardless of how much the script spells out for the reader why Black Cat has gone from mischievous burglar to aspiring mob boss and killer – because Spider-Man ruined her “reputation” – I just don’t buy it as an effective and well-justified character turn. That’s made even more ironic by the fact that in the story, Felicia couldn’t care less about when Spider-Man admits that he only betrayed her because his brain had been swapped with Doctor Octopus. So I guess if Felicia can be stubborn in the face of heavy-handed exposition about a character’s behavior, so can I. The sad thing is, it totally pains me that for two of the last three issues, Felicia has been the focal point of my post because I’d much rather talk about … pretty much anything else. How about that really great scene where Peter sees JJJ for the first time (outside of his costume) since the Superior-era, and he gives him that very warm hug that seemed to be as much about Peter being thankful to be “back” as he was happy to see Jonah. 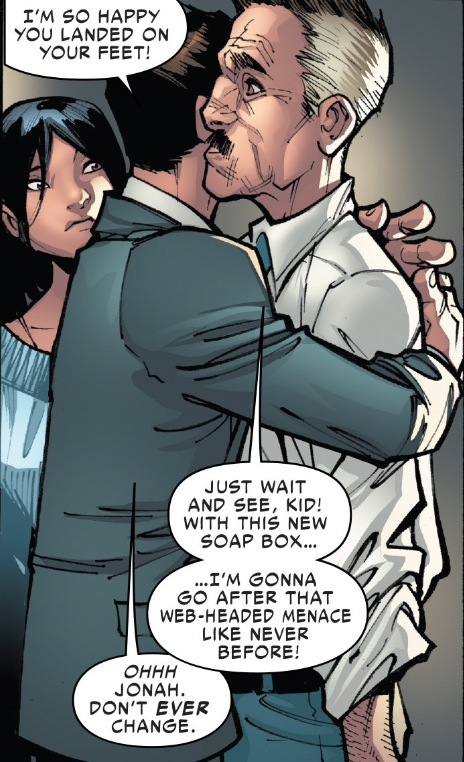 Slott and Ramos completely nail that character beat, demonstrating Peter’s warmth and sincere kindness, alongside Jonah’s grumpy but still-sorta-caring exterior. Unfortunately, such a great character moment only serves to further rile me up … how is Slott (and Ramos) getting some of these post-Superior interactions so right, while getting others so wrong? 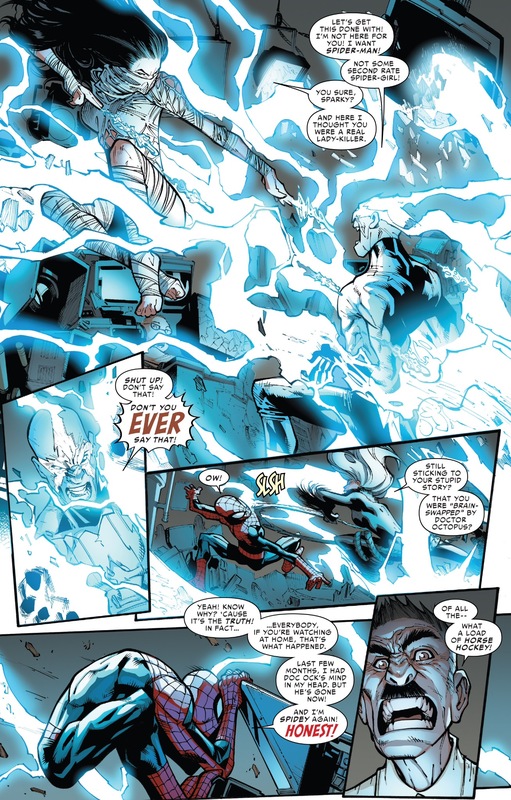 Still, there are other things I quite enjoyed in ASM #5, especially one idea that is introduced in this story that I imagine stands to be important in the near future: how New York City’s underworld is starting to reassert itself after the no-tolerance, preemptive strike era of the Superior Spider-Man. Granted, a career lightweight like the Eel has advanced quite far in this new power structure, but I think it’s incredibly important to remind readers of the potential fallout from Peter’s more reactive approach to crime fighting. That’s not to say that I’m championing Spider Ock’s methods over Peter’s (I’m on record as being on team “Amazing” Spider-Man), but I also recognize that there are plenty of interesting stories to be mined from exploring the ramifications of both approaches in reference to “street level” crime. Of course, before we get to the “street level” of Spider-Man, we are due to get a large dosage of high-level, multiverse-affecting threats, in the form of Morlun and “Spider-Verse.” And an assumingly key part to “Spider-Verse” is going to be Slott and Ramos’s new creation, Silk. I had an interesting reaction to Silk’s introduction in ASM #4 in that I initially found the storyline to be quite good, and then as time went on and certain things about her characterization marinated, I started to feel a little more cautious about where things may be headed. Just like Spider-Man in ASM #5, there is something I can’t explain about Silk, the person, that I’m drawn to. I do find myself wanting to read about this character and potentially cheer her on. Where things start to get sticky for me is the fact that as much as I like her voice, I question if Slott has picked the right voice for this specific character. By that I mean, I’m not 100 percent sure if a character who has been locked away in a vault for 10 years, far away from other human beings, and sheltered from any potential threats to her life, should be quipping as easily as she is, should be as well-adjusted as she comes across, and should be able to tapdance around a legit villain in Electro the way she does. In one scene, Peter makes a crack about Silk’s lack of people skills, and yet I can’t say she’s doing or saying anything that unusual or outlandish – at least in a comic book-y kind of way. Given the way ASM #5 ends, I imagine that Silk is going to play a role in preventing another “game-changing” thing from happening in Spider-Man’s life (he seems to be at risk of these every few months). Unfortunately, if that’s the case, it’s going to require some Silk/Black Cat interplay. I guess we’ll see for certain what I think of this new character once I have to deal with her mingling with someone whose appearances I’d prefer to gloss over at the present moment. “Just like Spider-Man in ASM #5, there is something I can’t explain about Silk, the person, that I’m drawn to. I do find myself wanting to read about this character and potentially cheer her on. Where things start to get sticky for me is the fact that as much as I like her voice, I question if Slott has picked the right voice for this specific character. By that I mean, I’m not 100 percent sure if a character who has been locked away in a vault for 10 years, far away from other human beings, and sheltered from any potential threats to her life, should be quipping as easily as she is, should be as well-adjusted as she comes across, and should be able to tapdance around a legit villain in Electro the way she does. See, this is why I may have had such a negative reaction and response towards Silk compared to yourself, Mark. In that aside from Dan Slott repeatedly having to hammer home the idea that anything Peter can do, Cindy can do better, he’s trying to tell us who Silk is but ends up showing us something else entirely. Also, regarding your observation with how Slott keeps prioritizing story, or rather plot, over character, I believe Cindy Moon/Silk is an embodiment of the plot-driven narrative. With Morlun last issue calling her the “Spider-Bride” and “The Spinner at the Center of the Web,” there’s this heavy implication that she’s another one of these “chosen one” type characters that I think is becoming all-too prevalent in popular fiction and entertainment. And given how Slott is appears to be taking his cues from JMS’ spider-totem storyline for Silk’s origins and the upcoming “Spider-Verse,”there’s now this heavy-hand of “fate” and “destiny” involved, which, in my opinion, doesn’t really gel with comic such as Spider-Man to begin with. Even Peter and Cindy’s “relationship” is entirely plot-driven instead of character-driven, in that their attraction towards one another isn’t the result of either character’s free will but because their “spider-instincts” are compelling them to be together. Also, and I saw this in another review of this issue, it really does seem as if what’s currently happening to the Black Cat is being done so as to make way for Silk. Note also how Carlie Cooper has been written out of the series (not much of a big loss, IMO) and how Mary Jane Watson is, once again, all but absent from the comic, as well–and how she, too, wants nothing more to do with Peter even though she knows full well what has happened was his fault.